President Obama and Star Trek's Uhura Flashing Vulcan Salutes. In the White House. As writer John Hodgman once said, President Obama is America's first modern nerd President. He's a huge Trekkie and loves Superman. A certified nerd. 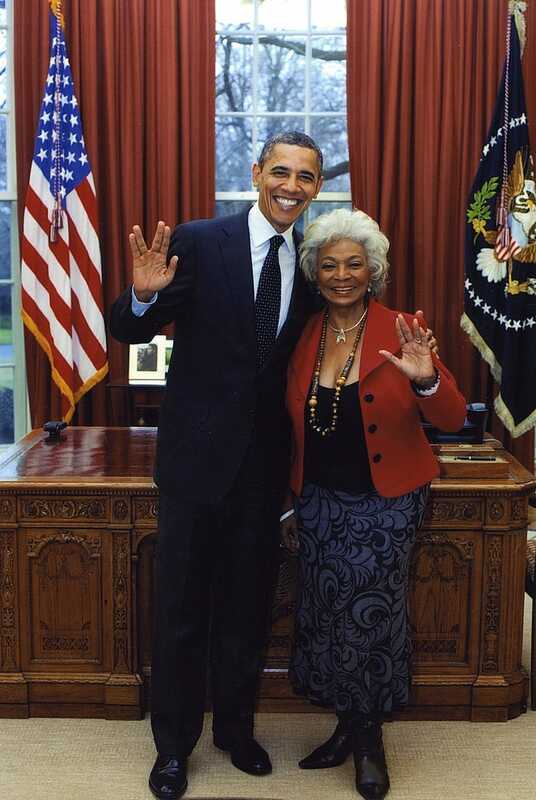 So when Nichelle Nichols, perhaps best known for her groundbreaking role as Uhura in Star Trek, visited the White House for Black History Month last February, the President and her didn't just get a photo op together in the Oval Office. Oh no, they got a photo op in which they gave Vulcan salutes. While flashing a Vulcan salute in public is neither a first for President Obama nor Mrs. Nichols, flashing one in the Oval Office has to be a first for both a sitting U.S. president and a Star Trek star. Perhaps? The photo was taken back on Feb. 29, but Nichelle Nichols uploaded it to her Twitter earlier this evening, adding, "A photo came to me in the mail that I've kept for myself for over a week, but now it's time to share it with Trekkers everywhere." Live long and prosper.